April/May is probably the nicest time to be in the Middle East. Not only because of the weather which is just fabulous (sunny and not too hot) but also because of the profusion of seasonal produce. 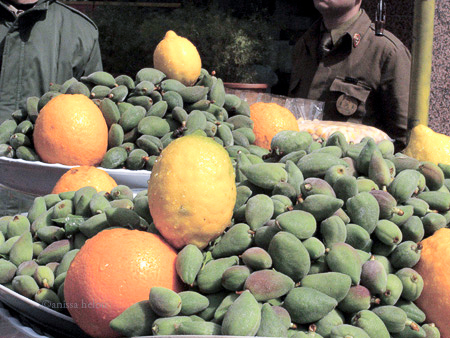 I was in Tehran recently and the produce I saw in the different markets I went to was simply amazing. Our farmers markets don’t even come close. 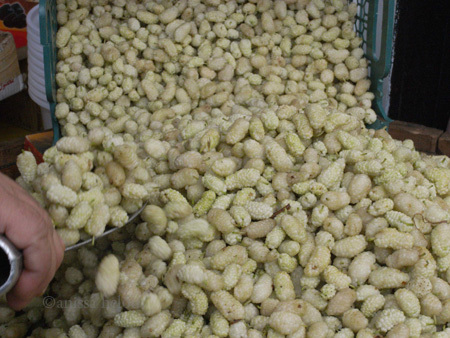 Here are a couple of pictures of the first white mulberries of the season for sale in Tajrish market. I bought half a kilo but I have to say they were not so sweet. Still too early in the season. However, when they are good, they are simply amazing. I can never decide which I like better: the white or the red ones. I guess both are fabulous. 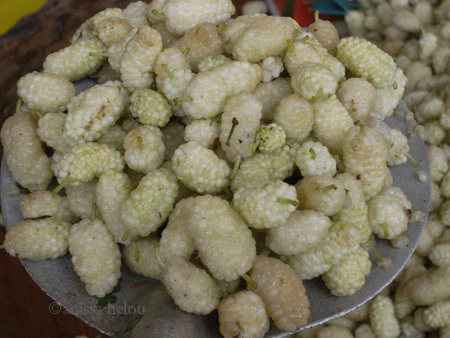 And recently, when I was in the Emirates, I found really long red mulberries but I am not sure if those are still called mulberries. Perhaps you can help. Should have taken a picture but I was filming and didn’t get the opportunity. I hear the weather is rather sad in Europe. Cold and wet in Paris, the same in London and just as cold in Milan. 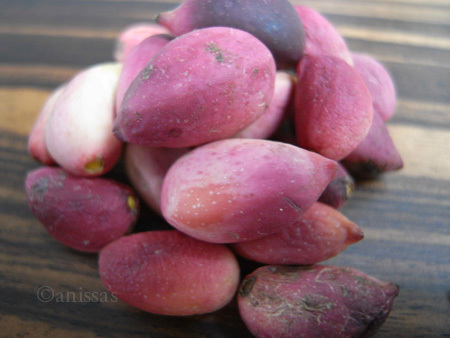 I can’t say that I am loving Dubai but at least it is summer here, with a lot of fresh produce and herbs piled in the markets including purslane (baqleh in Arabic), one of my favourite herbs. 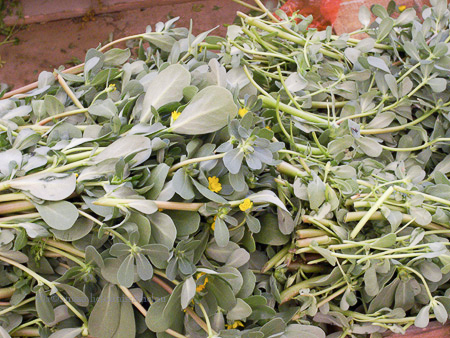 Despite the trend towards global ingredients, purslane remains little known in the west. Perhaps because it is fragile. The leaves bruise easily and you need to be careful handling it. I don’t normally wash it. Instead, I just wipe off any earth delicately with kitchen paper. And I have to admit that I very rarely buy it in London looking as fresh as it does in the pictures above and below. And I certainly cannot pick up as much of it as I want and just stuff it in a bag, as in the display here. Middle Eastern shops have the herb neatly bunched up and I often have to discard part of the bunch because the stalks are too tightly packed resulting in some of the leaves ending up spoiled. 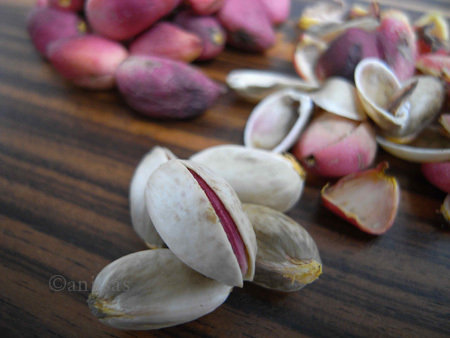 It’s green almonds season again. In full flow now but they were really expensive at the beginning — I paid $7 for 200 g about a month ago in Beirut which is a large amount of money for so little. Fortunately, when I went to Damascus a couple of weeks later, they were more plentiful and cheaper of course, and a lot larger too.